The event was inaugurated with a Welcome Address by Prof. Janat Shah, Director, IIM Udaipur, where he emphasized on the significance of management education in being a transformation experience for the students. He spoke on the importance given at IIM Udaipur towards entrepreneurship, analytics and developing leadership capabilities in students. The event saw stalwarts from the top E-commerce firms expressing their knowledge and views regarding the future of the industry. 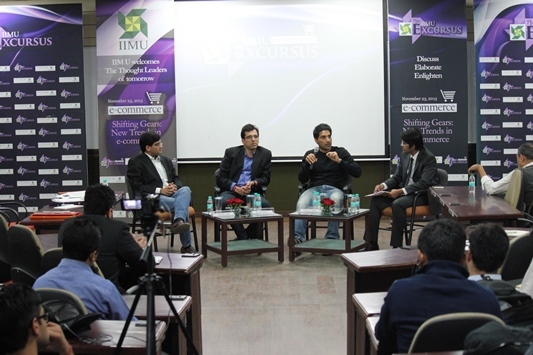 The panel comprised of Mr. Hitesh Oberoi, Managing Director and Chief Executive Officer at Info Edge (India) Ltd. and Naukri.com; Mr. Pranay Chulet, Founder & CEO of Quikr India Pvt. Ltd.; and Mr. Manish Godha, CEO and Founder at Advaiya Solutions Pvt. Ltd. The speakers brought in different perspectives to the discussion sharing their vast experience in the E-commerce business. They discussed the fast pace at which the E-commerce industry is expanding in India and the implications of the same. They shared their views on how companies can bring improvements and adopt various innovative techniques to meet the demands of the future.